None of were too sure how long it might take to get the keel in. The optimistic guesses were half an hour while the pessimistic guesses said a whole day. Thankfully in the end it was somewhere between. The initial plan was to lift Rafiki by crane, stand the keel up, and then drop her down on top of her keel. The weather forecast was for quite a bit of wind which didn't bode well for the craning part of the operation. However the KB Boatpark has a nice bit of forklifting kit which we were able to utilise instead which made for a high precision operation. It's safe to say we were hoping for the most uneventful weekend possible. And thankfully that's what was delivered. 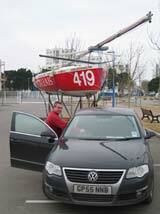 Welcome to my Mini Transat campaign website. This website is dedicated to bringing you the latest information on one of the most exciting and difficult sports in the world. Here you will find information on my latest activities and full campaign information both past and present. My current goal is to qualify and race in the Mini Transat race in 2007. This website will follow my progress in achieving this goal and allow you to discover more about the boat and the race.